Zinc carnosine is a synthesized form of carnosine originally discovered in Japan and formed by chelating zinc to carnosine in a one-to-one ratio giving it a polymeric structure.1 It is thought that combining zinc with carnosine could possibly provide additional benefits beyond what supplementing zinc might offer. This may stem from the fact that carnosine (a dipeptide comprised of β-alanine and L-histidine) acts in long-living cells found in muscles and nerves.1 It is also thought to support intercellular tight junctions and cell mediation.2 Zinc carnosine is also known as polaprezinc, zinc L-carnosine, and N-β-aminopropionyl-L-histidinato zinc(II). Let's explore Zinc carnosine benefits further. Zinc carnosine is thought to stimulate gut mucosal integrity. A 2007 study found an additional zinc carnosine benefit was that it reduced small intestinal injury showing a 50% reduction in villus shortening at 40 mg/mml (p<0.01).1 This appears to be particularly helpful in the support of intestinal permeability. Looking for more information on drug-nutrient interactions? Healthcare professionals can use this drug-nutrient interaction checker. Patients should consult their preferred healthcare professional. 1. Mahmood, A. F. (2007). 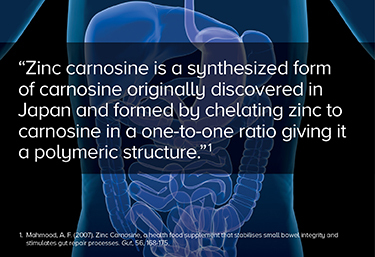 Zinc Carnosine, a health food supplement that stabilises small bowel integrity and stimulates gut repair processes. Gut, 56, 168-175. 2. Watari, I. O. (2013). Effectiveness of polaprezinc for low-dose aspirin-induced small-bowel mucosal injuries as evaluated by capsule endoscopy: a pilot randomized controlled study. Gastroenterology, 13, 108. 3. Gropper, S. S. (2013). Advanced Nutrition and Human Metabolism (6th edition ed.). Belmont, CA: Wadsworth, Cengage Learning. 4. Gaby, A. (2011). Nutritional Medicine. Concord, NH: Fritz Perlberg Publishing.